Volume 71 Number 3 2017 The Great First a quick history lesson the original G.I. Bill was enacted in 1944. 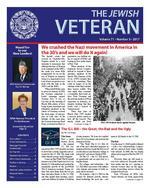 JWV proudly can claim to have been a strong supporter and ad vocate for the G.I. Bill. We, along with other veterans groups, made it happen! Some say that World War II brought America out of the Depression, but I say that the G.I. Bill enabled and sparked the remarkable growth of the post-World War II American economy. Young sol diers that came home from the war got their education thanks to the G.I. Bill, and they applied their learning, can-do spirit and military discipline to building a better America. VA loans also enabled these GI's to buy homes and reach for the American Dream. The World War II G.I. Bill, it's one of the most cherished programs in American History, it paid the full cost of an education at any four-year college or university, said Aaron Glantz of PBS. For the G.I. the G.I. Bill provid ed opportunity and an open door to a brighter future. For colleges and universities the astic students and revenue to build, ex pand and do research. For America the G.I. Bill was the catalyst for fantastic growth, interna tional leadership, the space age you name it. All thanks to the G.I. Bill. The Bad with a less understanding Congress addressed in support of the Post 9/11 G.I. Bill. However, there are still many is have gotten into the act preying on veterans because they see the oppor tunity of providing services where the recipient doesn't pay. Kate O'Gorman of IAVA said, "many veterans are being aggressively occured in Charlottesville, Virginia should be a stark reminder to Americans that were contained in the 1940s, the spark was never fully extinguished. As we see the today, it is important to look back at how our predecessors dealt with this hate in the 1930s and the 1940s. When Adolf Hitler came to power in January of 1933, the Germans unleashed a brutal campaign against German Jews. It was so bad that on the morning of March 20th, photos of Jews being beaten, terrorized and ultimately murdered in the streets of Germany covered the front pages of newspa pers on both sides of the Atlantic. At the same time, the German American Bund ganization, was holding ral lies in support of Hitler and beating up Jews in the streets When members of the American Jewish Congress refused to respond to these atrocities, members of the Jewish War Veterans of the U.S.A. (JWV) decided they had to do something. They could no longer sit on the sidelines while they watched these horrors unfold. That very night, they convened a committee that would ad supporters in America, ul timately deciding that they would start a boycott of German goods. Three days later on March 23rd, JWV headed a massive protest march to kick off the boycott. This march, which ran from We crushed the Nazi movement in America in the 30s and we will do it again!Continued on page 17 Continued on page 17 By PNC Carl Singer 1933 JWV Protest March Against Nazism CONTENTS Your Letters ............................... 2 Dvrei HaShomrim ................... 2 Message From the Commander .............................. 3 On The Hill ................................. 5 Membership Corner ............... 6 JWV in the Community ......... 8 Proles in Service .................. 14 Review ....................................... 16 National Ladies Auxiliary .... 18 Museum News ....................... 20 Taps ............................................ 22The G.I. Bill the Great, the Bad and the Ugly Convention Round Up! Page 12 JWVA National President Iris Goldwasser JWV National Commander Paul D. WarnerMazel Tov to our New Leaders! 3 Critical Veterans Issues Many veterans are not familiar with the work done by veterans organizations for over 30 years, which results in the publication of The Independent Budget. This year, the detailed study was performed by DAV, VFW, and the Paralyzed Veterans of America. The report is supported by 27 veterans organizations including the JWV. The following comments are based on this years 1. Strengthening and reforming the VA was the major issue before Congress in 2014. All veterans organizations agree that the best way to modernize veterans healthcare is by creating a system which coordinates the VA and community providers. The VA would be the primary provider and coordinator. 2. Comprehensive caregiver support for veterans has been provided by federal legislation. Unfortunately, Congress was more concerned with cost considerations and only provided full support for veterans injured on or after September 11, 2001. It is now up to Congress to provide funding for caregiver support for all 5.5 million veterans requiring it. 3. According to the Independent Budget (Report), The current backlog, dysfunction, and resource needs for the appeals process is the major driver for urgent fundamental reform. Much of the dysfunction within the appeals process relates directly to inadequate resources. These critical issues can be addressed with proper funding by Congress. The Congressional appropria tion for 2017 is $63.3 billion, and Congress estimates that the VA will collect $ 3.3 billion this year from Medicare and other insurance companies for a to tal of $66.6 billion. The Independent Budget recom mends $72.8 billion, which leads to a 6.2 billion short age. The projected shortage is even greater since the VA has not been very successful in collecting funds from other organizations.Improving VA AdministrationThe VA has many problems, which have the Department of Veterans Affairs Accountability and Whistleblower Protection Act was passed by Congress and signed into law. It streamlines the process to remove, demote, or suspend VA employees for poor performance or misconduct. In addition, it authorizes the VA Secretary to recoup any bonuses awarded to employees who have acted improperly. receiving attention is the record keeping problem stemming from the non-compatibility of the Department of Defense and the VA medical recording systems. Patient and research data should be an attempt to resolve the problem.Critical Jewish Issue Anti-Semitism Anti-Semitic incidents seem to spring up each week on college campuses throughout the United States. According to a study, The strongest predictor of anti-Jewish hostility on campus is the presence of a Boycott, Divestment and Sanctions (BDS) campaign against Israel. We have a group of young people who believe that the problems of the world are being caused by Jews. For many years we overcame this problem, but now successful propaganda from the Palestinians and others have provoked a frightening backlash against Jews around the world. This includes the U.S., where there are groups like the Students for Justice in Palestine (SJP) that have a history of harassing and intimidating Jewish students. They are making colleges an unsafe environment for Jews. Here are some examples: 1. At Vassar College, this hate group tried to shut down a class trip to Israel to study water issues. terrorism against Israeli Jews and called for Israels destruction. During midterms, the SJP invaded students privacy rights by planting authentic-looking eviction notices under dorm room doors. 3. At University of Chicago Illinois, their Black Lives Matter chapter and Student for Justice in Palestine Israel puts people in jail around the world. 4. At Temple University, the SJP demanded that a proIsrael speaker be cancelled, threatening that otherwise Jewish students would face increasing hostility on campus. 5. At UCLA, the SJP demanded that candidates for student government sign a pledge not to go on any trip to Israel sponsored by three Jewish organizations. Student groups like the SJP with support from anti-Israel faculty and outside groups, focus their rage singularly on Israel, condemning the Jewish State with a viciousness that is not applied to anyone else, and Jews around the world are being held collectively responsible for Israels actions. This is anti-Semitism, according to U.S. government standards. We must not tolerate Jewish students being targeted. According to the FBIs latest hate crime statistics, two-thirds of all religious hate crimes committed in 2012 targeted Jews. You must exercise your moral duty as leaders and publicly speak out if anti-Israel speech and conduct on campus crosses the line into anti-Semitism. We appreciate that college campuses should encourage free and open debate and the robust exchange of ideas. We support these principles, but none of us should tolerate a campus university rules and policies supported by university funds without consequences. JWV, and is already getting to work! JWV at the White House Veterans Day Breakfast, and afterwards, hosting a very special Veterans Jewish Military History. Sidney Goldberg, Post campaigns for Paul Warner at the National Convention.National Commander Paul D. Warner FROM THE COMMANDER MESSAGE Paul D. Warner Elected National Commander at JWV's 122nd Annual Convention! 6 MEMBERSHIP CORNERWhat drew you to join JWV? While I was on active duty, my uncle (Edward Lischinsky), a life-long member of JWV in Massachusetts and proud member of the Army told me about the history of JWV and that I should consid er joining. Shortly thereafter I was approached by an that I could be a member of JWV in an In-Service membership status. My big takeaway from your response is that recruit ment isnt just a one step process. It can take more than one person more than one conversation to get a new member. It also demonstrates how valuable a recruiting tool the In-Service Membership is. Agreed. In-Service membership affords the active duty member a chance to learn and share the values of So when they leave the service, they dont even have to think about whether or not they want to join. They already know how special the organiza tion is and are ready to get involved. You joined because you were asked. But why did you stay? I stay because JWV is an organization that I believe serves a tremendous purpose and support network to members of our faith. It is an organization that has provided me with coaching and mentorship and has allowed me to take an active role in our post and mili tary community. I am fortunate enough to belong to an organization that makes it a priority to takes an active commitment to the ideology of supporting our nation, our community and our veterans. As a mem ber of the JWV team it allows me to participate and give back to veterans that came before me that helped make my tour of duty a bit easier. The freedoms that they fought for are the rights and privileges that we all enjoy today. Just like a lot of the Members I talk to every day, you think of your work at JWV as a continuation of your service. As you step into this new leadership role, what do you think the biggest challenge is for the Membership Committee? move our organization forward. We are always try ing to actively recruit new members that is a given. The days of members knocking on our Post door and wanting to join are over, which it is unfortunate be cause we as an organization became very comfortable and relaxed in our recruitment process. This is com pounded with a decreasing target market of members of our faith; I admit we are in a challenging situation. A greed. The population of Americans who serve in the Armed Forces has decreased by over 90%. Jews are already a minority, so the number of people eli gible for Membership had decreased dramatically. Demographics are not going to aid us in our recruit ment efforts. That said its chal lenging but not im possible. The current situation does not mean that we cannot try different ways introduce JWV to Veterans of our faith. To increase membership, thinking out of the box may help. Maybe we have to look at where we locate our posts and what activities to get involved with. Perhaps we could consider creating new posts or relocating exist ing posts closer to active duty military bases. Proximity to large numbers of active-duty personnel would certainly make recruiting In-Service mem bers easier. There are also colleges and universities that are full of potential future members of JWV. But what about average JWV members, who might not have the time or the resources to start a new post near a base or a college? What can they do to help ensure the future of the organization? JWV is a strong organization and the secret ingredi ent of the success of JWV lies with our membership. Our membership is made up of many dedicated and loyal individuals that continue to volunteer and serve. The one thing every JWV member can help with is something sparked your interest to raise your right hand and volunteer to take the oath of JWV. Share that experience and let potential members know your reason why you joined JWV. Make it your personal goal to recruit one new member into your Post within the next twelve months. It all starts with an ask. Yes! As your own recruitment story illustrates, its the personal connection that can really make the difference. At National, we talk to potential new members on a regular basis, and oftentimes there are people who want to join but dont have any friends in the organization. We are usually able to pair them with a sponsor, but sometimes we struggle and commit to really welcoming the new member. get involved in every aspect of the organization. If re cruitment isnt your strong suit, get involved with your I guarantee each level is looking for help.7 Questions with a JWV MemberMember: Selina S. Kanowitz Post: Furer-Barag-Wolf Post 126, NJ Current Residence: Voorhees, NJ Military Service: Desert Storm, USAF Reserve, 21.5 years Member Since Year: 1991What was a special moment for you, as a Jew, serving in the military? In basic training I was appointed Dorm Chief, in services each week, accompanied by a group of nonJewish airmen who were interested in learning about Judaism. Whenever possible, I also included them in Jewish base activities. For what one thing is Post 126 best known? Post 126 is one of the largest and most active JWV posts! What is one of your fondest JWV memories? After the call up for Desert Storm, I was invited to a speaking engagement with a JWV post, and was awarded an honorary membership. After that, my command was motherhood. I retired from the Air Force after 21 1/2 years. More recently, with our children grown and out of the house, I turned my attentions to JWV Post 126, while still pursuing my career as a nuclear medicine technologist. With time, the post recognized my contributions and then, it was just a few short steps to rising to the rank of Post Commander. If you could improve, or completely invent, a JWV program to improve our service to veterans, what would you do and why? Companions to Heroes is my pet program for this year, which unites veterans and homeless animals. It is a win win situation. The animals are saved and the disabled veterans of varying degrees are assistance of the animals. What display of patriotism in your community makes you the proudest? I live 10 miles from the Liberty Bell, and two blocks from there is the Mikveh Israel Synagogue, the oldest formal Jewish congregation in Philadelphia. In its 270-year history, Mikveh Israel has consis tently demonstrated that Jews could be patriotic to the American cause, most notably, in the person of In this issue we welome JWV's new Membership Chairman, Barry Lischinsky. Barry has held a variety of leadership positions within his Post and Department and is a proud member of Post 220 in Massachussets. Barry spoke with JWV sta membership coordinator, Mara Sherman, about the membership challenges and opportunities facing JWV as we move forward. Continued on next page In a few weeks, JWV will be rolling out our new revamped website, where you will be able to nd: A dues payment portal A Post locator map Important tax information Recruitment material Info about JWVs activism on behalf of Veterans Back-issues of The Jewish Veteran And much more! 10 JWV IN THE COMMUNITY The men of JWV Post 692 are mustering for one last battle against being forgotten One long night during the Vietnam War, Air Force Capt. Sheldon Goldberg was killing time, wait do, and I had a ridiculous epiphany, he says. I took a grease pencil and I wrote on the board, Whats a nice Jewish boy like me doing in a place like this, killing Buddhists for Christianity? It was 1969 and the M*A*S*H-like bit of sub version didnt land him in hot water with the brass. Everyone thought it was quite humorous, says Goldberg, now 78, who served just under 30 years un til his retirement in 1985. That relatively few Jews serve in the military to day irks men like Goldberg. The profound experience of war stamped them in a way like no other. Those ex periences, from the ridiculous to the hair raising, are threads in a uniform that he and his fellows in Jewish War Veterans Post 962, representing Rockville, wear every day. Increasingly, they say, fewer people respect the uniform. Is WJW anti-Jewish veteran or just anti-mil itary? read the subject line of an email Goldberg sent in June. Thats how this story began. It isnt just this newspaper, its the Jewish community at large, Goldberg said when I called him after receiving his ing forgotten. Thats why they built the memorial. It stands in front of the Bender Jewish Community Center in Rockville a 12-foot-tall sculpture by Bethesda art ist Phillip Ratner, a Wall of Honor facing the sculp ture. The memorial is hallowed ground for them standing so that the Jewish community will see that there is a place where its heroes, both alive and dead, can be honored for their service and for their sacri But what if you built a memorial and nobody came? When Post 692 held a rededication ceremony sponse was underwhelming. We contacted all the synagogues in four counties and nobody responded, says Stuart Freeman, the posts commander. The bigger problem is that we did a lot of publicity, says JWV post member Marshall Sneiderman, 78. And nothing. And so they gathered at the memorial on a hot communitys dereliction of duty when it comes to the military and the contributions Jews like them have made to this countrys defense. Except that once out of the hot sun, anger subsides to low-grade resentment. What comes out instead is that barring another mass mobilization, another World War II or even Vietnam, there will be few new Jewish veterans because so few Jews enlist. The best these men in their 70s or bet ter can do is search for a way to reach the young few and try to preserve and protect their organi zations past accomplishments. And tell stories, lots of sto ries. Like Goldbergs whiling away a dull night with a grease pen cil, each one has been honed to a sheen. He erased the board, but he kept the story. There were half a million Jews in the U.S. mili tary then. Since Vietnam cast a shadow over military service, those numbers have declined. Today, Jews form only 1 percent of the military, says JWV mem ber Elliott Robinson, 78, who spent six years in the When Robinson signed up in 1957, there was no question of why. Everybody was going into the mili tary in one fashion or another at that time. Gold says there is room in fewer peoples lives for that kind of service. People have two jobs now. And the young are hooked on their electronics. The memorial went up in 2008, but proved inac cessible. The post made plans to move it to its current spot you cant go from the parking lot into the JCC without passing it and Gold raised $30,000 to pay But you dont get a real sense about what war and service is about unless you talk to the guys. Freemans In all this time, I never joined anything, he says. But the dwindling number of Jewish vets and the memory of what it was to serve in uniform brought him around. Five years ago, he joined the Jewish War Veterans.This article was rst published in the Washington Jewish Week. Talking Old Soldiers By David HozelPoughkeepsie Post Attends Franklin D. Roosevelt 135th Birthday Commemorationby Martin C. HochhauserOn a cold but clear day on January 30, 2017 dig the birth of our 32nd president, Franklin Delano Roosevelt. Born on January 30, 1882, this year we celebrated FDRs 135th birthday. It was a beauti ful ceremony as The Long Gray Line of West Point cadets came marching into the Rose Garden to the beat of a solemn drummer. Following this majestic entrance came over a dozen dignitaries who present ed wreaths to honor President Roosevelt. The local community was on the periphery of the Rose Garden to witness this annual event. Among the twelve groups presenting wreaths, one group was the Jewish War Veterans of the United States, Pvt. Herman Siegel Post #625 of Poughkeepsie, Schwartz and Chief of Staff Martin Hochhauser. Our Post was named after a local resident, Herman Siegel, who was born and bred on May Street in the City of Poughkeepsie. Born in 1925, he graduated Poughkeepsie High School in June 1943 and joined the Army. Eleven months later, on May 18, 1944, at age 19, Pvt. Herman Siegel was killed the local Jewish community to die in World War II. In addition to Commander Schwartz presenting the JWV wreath, Chief of Staff Hochhauser placed a stone on FDRs tombstone in the Jewish tradition to indicate that a visitor has come to show respect, that the deceased has not been forgotten and to rekindle the memories of the past. wreath was presented by Brigadier General Cindy R. Jebb, Dean of the Academic Board, United States The formal event was concluded with salutary vol ing of Taps. The Long Gray Line marched out of the Rose Garden once again to the sound of a drummer. Finally, everyone was invited back to the Visitors Center to partake in two huge birthday cakes and hot beverages. Sta Martin Hochhauser. Stuart Freeman Sheldon Goldberg Members of Post 692-MD in front of the Jewish Veterans Memorial in Maryland. 11 JWV IN THE COMMUNITY By Randall LiebermanIn 1998, the Jewish War Veterans "Irv Steinberg" Post 440 of Boynton Beach raised $146,000 to purchase a 17-passenger bus for the exclusive use of the Veterans Administration Medical Center of West Palm Beach to transport disabled veterans. Then, in late 2016, the post was told by the center that the bus had become inoperable after about only 60,000 miles and that the bus would have to be scrapped. Post Commander Jerry Schnur, 90, of West Palm Beach, a Coast Guard veteran from World War II, viv idly recalls the moment he heard the news. "When the member was talking about how the bus had to be scrapped, I interrupted his report to go on record that I took full responsibility for getting this bus back on the road," Schnur said. "In the memory of those members who had worked so hard to purchase this bus, I knew we had to do something." Schnur decided to have Michael Corbett, 71, of Boynton Beach, a Marine Corps veteran from Vietnam, look into the matter. "Michael is my left-hand man and also my righthand man," Schnur said. "He's like a magician. I knew he would get things done." Corbett had the bus checked out and it was de termined the cost of replacing the engine (which had a cracked block), including labor, would be in excess of $16,000. "We operate on an annual budget of around $5,000 a year," Corbett said. "And 85 percent of that goes back to our own veterans. I didn't think we'd be able to come up with that kind of money." So Corbett contacted the bus manufacturer Thomas Built Buses, headquartered in High Point, Following some discussion between Corbett and a new engine for the bus. Following further discus sion, the company agreed to pay for the installation of the new engine, as well. Buses were concerned for the welfare of our veterans," Corbett said. "They wanted to give back to those who had served their country. We, in turn, are so grateful for the company's generosity." After the necessary mechanical repairs were morning, June 30 in which Schnur present ed the keys to the bus to Jon Roberts, chief of facilities management at the center, in recog nition of the bus being able to get back on the road. "Thousands of veterans have already been served by this bus, and we hope thousands more will now be able to be served," said Roberts after accept ing the key. Schnur and Corbett were thrilled with the turn of events. "This is one of the happiest days I've had in a while knowing that we put this bus that bears our name back on the road," Schnur said. Thomas Built Buses Company for its generous re sponse to our need to revitalize the bus that means so much to the thousands of disabled veterans in South Florida who rely on this transportation to attend to their life-saving medical appointments." able to provide this donation. In an email to Corbett, Ricky Myers, technical service manager of Thomas Built Buses, wrote, "As for Thomas Bus, we are proud of our veterans, and we cannot thank them enough for what they did and what they do." thanked the post during the presentation. "The Jewish War Veterans do so much for our medical center," said Mary C. Phillips, the center's chief of voluntary service, in her intro ductory remarks. "They are one of the organizations we can count on the most for help." Added Donna Katen-Bahensky, the center's director, in her closing remarks, "I want to thank everyone for coming to this wonderful day for the VA Medical Center. "For more information about JWV Post 440, contact Michael Corbett at ocusmc@hotmail.com or 561-7428016. This article was originally published in the Jewish Journal (South Florida).JWV Post Rededicates Bus For Disabled VeteransJerry Schnur, commander of Jewish War Veterans Post 440 of Boynton Beach, speaks at the VA Medical Center in West Palm Beach at a rededication ceremony for a bus the post purchased to transport disabled veterans to and from the center. Post member and VA chair Arnold Zenker observes operation of wheel chair lift.New Jerseys Jewish War Veterans Education Grant ProgramMort MillingerAt the 86th Convention, the Leo A. Seigel Dr. Philip Shapiro Education Grants were awarded to three deserving recipients Austin Grant, Joshua Schuman and Eric Schneider. All are direct descendants of JWV mem bers, and we could not be prouder of their education, athletic and community accomplishments that con tributed to them getting these awards. these grants annually to graduating seniors from pub All applicants must be a direct descendant of a mem ber, living or deceased, of a Jewish War Veterans Post This years recipients are a prestigious group of young adults, and we know that they will go on to do great things for our community as well as the United Duke University. Joshua Schuman of West Orange, tending the University of Maryland. Congratulations Recipients of New Jersey's JWV Education Grant, from left: Austin Grant, Joshua Schuman and Eric Schneider; and Mort Millinger, Chairman of the National Youth Acheivment Program. JWV Foundation 2017 Grants have all been awarded. Information for the 2018 Grants will be availabe on the JWV website in the spring of 2018. 13 Feuereisen-I. T. Rockman Award Department of New Jersey Nassau-Suolk County Council, NYBen Kaufman AwardDr. Harvey Bloom Post 256, TALOWolfson AwardManhattan-Cooper-Lt.Col Larry EpsteinFlorence Greenwald Post 1, NY Department of MassachusettsNational Commanders AwardMaurice Kubby Post 749, TALOJoseph Demiany Memorial AwardNassau-Suolk County Council, NYPost-9/11 Veteran Support AwardManhattan-Cooper-Lt.Col Larry EpsteinFlorence Greenwald Post 1, NYRecruiter of the YearGeorge Hart, Centennial Post 112-SW Barry Schneider, Martin Hochster Memorial Post 755, TALOEdward D. Blatt AwardAlbert Adler, Department of NJBrennerJaee Memorial AwardBest Monthly Publication Valley of the Sun Post 194, SW Best Bi-Monthly Publication PFC Frederick Hecht Post 425, NY Best Quarterly Publication New Beacon Dept. of NYOutstanding Email NewsletterMartin Hochster Memorial Post 755, TALO Most Improved Online EngagementDr. Harvey Bloom Post 256, TALOPost GrowthSmall Posts Sam Luna Post 106, NY Medium Posts Colin J. Wolfe Post 95, VA Large Posts Edward D. Klein Post 138, CA Bountiful Posts Atlanta Centennial Post 112, SW JWV IN THE COMMUNITY Convention Round-Up! Albert Adler, Dept. of NJ Marc Thurston, Post 138-CA Peter Levy, Post 755-TALO From left: PNC Sheldon Ohren, Post 425-NY; Michael Menschel, Post 250-NY; Lewis Wunderlich, Post 488-NY; and Gerald Alperstein, Post 1, NY From left: Allan Cantor, Post 256-TALO; Scott Stevens, Post 749TALO; Art Kaplan, Post 256-TALO; Barry Schneider, Post 755-TALO; Ken Ashworth, Post 753-TALO; and Andy Lavigne, Post 256-TALO.JWV 2017 Award WinnersBoston Chapter Donates Collections To Needy Hospitalized VeteransOn January 30, 2017, representatives of Sharon Post 735, Jewish War Veterans of the United States pre sented a check in the amount of $1,600 to Richard Leeman, Assistant Chief, Voluntary Service and Lana Otis, Voluntary Services Program Manager at the Brockton Campus of the Veterans Administration Boston Healthcare System. The Post collected these funds during their Veterans Day solicitation at Shaws Supermarket in Sharon which took place from the personal needs of these men and women while un dergoing treatment and extended care within the VA fa cility. Among the items provided are specialized tele phones for the used of paralyzed patients so that they may more easily maintain contact with their families. Since 2009, the OPost has raised and contrib uted over $23,000 to this organization. In addition, Sharon Post 735 has received the Jewish War Veterans Department of Massachusetts Community Service Award for their continued support of hospitalized veterans for the years 2014 and 2015. The Post also regularly sponsors deserving seniors from Sharon High School and Stoughton High School at the an Tomorrow scholarship breakfast program. The Jewish War Veterans is the oldest veterans organization in the United States. It was formed in 1896 to support the veterans returning from battle with grave wounds, both physical and mental. The Jewish War Veterans Post #735 is a Sharon Massachusetts JWV Post dedicated to carrying on the traditions of racism and bigotry. From left: Richard Leeman, Lana Otis, and Paul Maltzman, quartermaster of Post 735-MA. 14 PROFILES IN SERVICE IN THE BELLY OF THE BEASTBy Julian Haber contained the last coal-driven propulsion system used pelled her to 21 knots at full speed. Some of vessels more than one ton shell thirteen miles. Before World craft guns and develop a capability to launch aircraft. Abie Fox, a Polish migr and Fort Worth, Texas 1917 and immediately shipped out for training at the the USS Texas as a Fireman Second Class on June 28, 1917. He looked forward with much anticipation to action as part of the 9th Battle Squadron operat ing out of Scotland. However, a funny thing happened off the coast of Rhode Island at the mouth of Long Island Sound, the Texas ran aground on Brock Island. She could not maneuver off until towed to open water by tugboats. Suffering extensive damage and needing 1918. cult and at worst as horrible. A coal barge anchored next to the ship. Large cranes lifted the fuel onto the Texas deck. Then Abie and much of the rest of the crew shoveled coal down large chutes that led to coal bins in the engine room. As a Fireman 2nd Class Abie Fox transferred large black chunks from the bins onto who placed the fuel into the boilers. He along with his comrades sweated profusely from the searing heat, in haled unhealthy coal dust and thick smoke that led to occasional shortness of breath. One of his crewmates stated that his skin turned so dark after his shifts in the engineering/fuel room that he hardly recognized himself in the restroom mirror at the end of a shift. Another fellow sailor, Charles Hergut, said, Hell When the vessel ran at slow speed and the boil ers dimmed somewhat, Abie and his shipmates often got meat, onions and potatoes from the galley, placed them in a coal scoop and cooked a stew in one of the not get black lung disease, pulmonary or stomach cancer. When the Texas arrived on February 11, 1918, at the Scapa Flow in the Orkney Islands off the coast of Scotland, she was assigned to Battle Division 9 of the 6th Battle Squadron of the British Grand Fleet. Abie and his crewmates in the boiler room kept the of its estuary on the Jade and Emms Rivers to chal lenge the Allied shipping. However, after seeing the Texas and other large ships, they retreated beyond gun range and a major encounter never occurred. east of the Isle of May and escorted the enemy to the Firth of Forth, Scotland, where surrender and im poundment of the Boche vessels occurred. She got un der way again December 12, when together with other George Washington carrying President Woodrow Wilson to Brest, France on his way to the Paris Peace Conference. Two days later the ship embarked for his service to America two months later and left his battleship to return to civilian life.SHE THOUGHT SHE WAS HARDLY WORTH MENTIONINGBy Joel Michaels Gladys L. Lonstein-Gaman, a member of our coun trys greatest generation, recently passed away, just two weeks shy of her 100th birthday. She served in the II (1943 -1946), where she was assigned to the 121st Station Hospital in Braintree, England. After the War, she lived most of her life in Peabody, Massachusetts where she raised her family. Her two sons, Steven and Philip, survive her. I am Gladys nephew. Gladys came from a modest background in Worcester, Massachusetts, where she lived with her two sisters and younger brother. She was an unas suming woman who did not seek recognition for her military service. During an interview in 2004 by the diminish the extent of her contributions to the War effort. When asked why she enlisted as a nurse at age 24, she said I had to be a part of it in some small way and nursing was the only way she could make a contribution. She went on to say that my involve ment seemed so small to me as she compared it to the many young men who saw combat and thought it was hardly worth mentioning. Like many American Jews who served in World War II, Gladys gave two reasons for her service. The we would have been next. The second was to help my people who were being persecuted in the concen tration camps. Supporting American soldiers in the some outreach to her fellow Jews who were victims of the Holocaust. Her remarks provide context for why a alone to enlist and go on to England to face an uncer tain future during a most troubled time. Although Gladys saw her contributions as a mem that way. One night, while on duty at the hospital in England, Gladys experienced the impact of a German warplanes bomb. After she emerged from the rubble and from under the desk she used for cover, she saw mediately directed her attention to ensuring the safety and health of the patients in the ward. Her response and actions that day were the subject of a Majors extremely hazardous conditions, Second Lieutenant essary work of attending to the patients in the ward. Gladys explained her reactions that night by saying that she probably was too dumb to be scared and all I knew was that I had to get the patients to a safe place. Since World War II, the role of women in the American military continues to evolve. Some of this change can be attributed to the actions of many wom Corps. Like their male counterparts, they too were fearless in ensuring that our country would not fail in defending its security and freedom for its citizens, while restoring peace throughout the world. To this day I remain in awe of the contributions they made. DONT FORGET TO DUCKBy PNC Sam Greenberg Marty was born in Wilks-Barre, PA, and he was one of three brothers. They grew up in a small town with around 4,000 Jews, which was a large Jewish popula tion for Wilkes-Barres size. He was a Boy Scout, and he always wanted to serve his country and to follow in the footsteps of his brother Sam. His chance came when he was drafted at the be ginning of the Korean War. His brother Sam dropped him off at his local train station to go to basic training. Sam told him, Dont forget to duck, and he laughed and continued to smile as he got on the train. He trained at Fort Sam Houston to become a com bat medic, and he joined the First Armored Division at Fort Hood, where they deployed to Korea. He worked diers. He always said, War was hell, and thats pret ty much all he would say about it. He was wounded three times during the battle of Pork Chop Hill, and he received a bronze star and a silver star for performing his duties. 15 PROFILES IN SERVICE He spent 10 months in Walter Reed recovering before going home to Pennsylvania. He decided he would become a watchmaker and diamond setter, which he really enjoyed quite a bit he did it the rest of his life. There, he met Sondra, and they had three sons Mark, Allan and Kevin. Marty was a dedicated member of the Jewish War Veterans of the U.S.A., and spent more than 40 years giving back to other veterans. Marty passed away ear lier this year, but we will always remember him, still smiling. HOW JEWISH VIETNAM VETERANS WERE TREATEDBy Jerome Frank My name is Jerome Frank, and I am a Vietnam Veteran. Let me tell you that being a Jewish Vietnam Veteran was not easy. In the Army, I was subjected to anti-Semitism, and when I came back, I was shunned by the Jewish community. Here is my story: In the fall of 1961, I was in night school taking classes in accounting right around when the Berlin crisis was starting. I was drafted in January 1962, and I went to basic training at Ft. Jackson, South Carolina and advanced individual training (AIT) was in Ft. Eustis, Virginia. After completing school, I was sent to Ft. Knox, Kentucky. My wife joined me there where we rented a property off of the base. My landlady owned practically the entire town of Muldraugh, Kentucky. One day she was in the house we rented and happened to see my wifes Jewish cook book. At that time she said to my wife, had she known we were Jewish, she would never have rented to us. The next day, we were about to leave for Shabbat services when the sheriff came to our house with his siren on. The sheriff happened to be our landladys He told us that we were being evicted and we must be out of the house as soon as possible. About a week later, I received a call from Ft. Knox telling me that I had to be off the post by Monday at 4 PM. I called a friend of mine in Personnel and asked him. Where was I headed for? The friend called back and said I was not on any deployment. We started packing up our car over the weekend. I was told to take my dependent home and to report to Ft. Riley, Kansas. In order to leave a military installa he called the Dept. of the Army. After that call, I was the orders. I was a Private E-2. After I arrived back in Philadelphia with my wife and our belongings, I was off to Ft. Riley, Kansas for deployment. After a month or so, we formed a compa ny and packed up our gear and left for points unknown. After being in the air for a few hours, we were informed that our destination was Vung Tau, South Vietnam. I dont have to tell you how it was in Vietnam during that period of time. My tour of duty lasted for 10 months, 3 weeks and 3 days. Upon arrival back home, we were treated as baby killers and even had things thrown at us. I tried to join a Jewish War Veterans Post, and I was turned down because Vietnam was never declared a war at that time. I told the people who were at the bank looking for people to join the War Veterans groups that sol diers are dying there, but no one cared. Finally, I told a friend about being denied for membership, and he made sure I could join. During Vietnam and coming home, Vietnam vet erans and their loved ones were the only people who should be treated like the Vietnam veterans.LEADERSHIP UNDER FIRE By Marc Wolf In my roles as an Anti-Submarine Warfare Intelligence always led with the Boy Scout Oath and Law as my guide posts. On my honor, I will do my best. Those words are the opening lines of the Boy Scout Oath. You see, I grew up as a Boy Scout, earned the Eagle Scout by the age of 15, and those words are the code -let watchword be duty -by which Id lived my entire life, especially when my own leadership came under An enlisted man under my charge, but one year my specialists I ever worked with during my tenure in the spirit, Jesse is one of the few people Ive known who truly gets it and whom I would trust to lead in all situations. At the time, hed been doing what he does best for almost ten years and has what it takes to make it in have him, and I was lucky to work with him during the signed to SEAL Team TWO. advancement process. How else do we retain and was ten years in and was selected as Intelligence all his accolades, Jesse had still not achieved an im ignation to earn before he would make this important career advancement. He hadnt earned a Warfare Device. His best chance wouldve been on a previ ous tour of duty aboard an aircraft carrier, but he was so busy looking after others, he missed his chance to meet all the requirements and was turned down by the review board. grant an exception for Jesse. So the senior leadership promised Jesse in my presence that we would make it happen -I made that commitment. As Jesse's superior, I not only had a personal interest in seeing this thru, it was my responsibility command. I vowed that under my watch, Jesse would advance. A month later our situation changed, we had to act fast to take advantage of our enemys position, and we had to move men into place to be ready. I was sent to another location in Afghanistan, but before I left, I laid out plans for how our manpower should be used. I made it part of my plan to keep Jesse behind. He was just three weeks from reaching his goal his Warfare one of our best, I trusted the other Sailors in my de partment could complete the mission, and for personal In the military structure, you dont question your command. Its virtually unheard of and carries seri ous consequences, but I reminded my superiors of the promise they made to Jesse and of how important it was for us to keep that commitment. the greatest asset he can have is a good name. So, I put myself on the line to help Jesse Harrahill to help him earn his warfare device and advance to Chief, to help the overall group and to help morale to let them know they can believe and trust the chain of command the right thing. In the end, Jesse was able to accomplish his goal. Today, he proudly wears the khaki uniform of a Chief, Jesse knew I stood up for him in Afghanistan. He knew I put career and myself on the line. On my last day of active duty service, he honored me with a plaque inscribed with my own words, my mantra: Always do the right thing and take care of your peo ple no matter what. He added his own sentiment to the plaque: It is because of your devotion to this prin ciple that I proudly wear my pin. In my life I hope to always remain true to those words my own words, my own promise and watch word whether as a supervisor, in management as an executive or as a member of a group taking care of my teammates. It is my hope to always surround myself with people of integrity and honor, who stand up for whats right, who consider the good of the group, and most importantly, who keep their word, no matter the risk. Words such as these remind me of my sense of duty, honor, purpose, doing what's right in the most out for each other, my fellow Sailors and Marines, my comrades-in-arms, my band of brothers. I know I al ways will. 19 www.jwva.org Fall 2017 National Ladies Auxiliary of the Jewish War Veterans of the USA National Musuem of American Jewish Military History (NMAJMH) By Louise A. Baraw, PDP, Chairman ing used for storing and exhibiting of American Jewish Military History The historical data in the museum documents and preserves the contributions of Jewish Americans to the peace and freedom of the United States, and serves to combat the belief that Americans who served in the Armed Forces. The museum is a member of the Kalorama Museums Consortium, established in 1989, to pro mote off the mall museums and the neighborhoods they are in, within the greater Dupont-Kalarama area of Washington, D.C. I ask that you preserve this legacy by becoming a member of the Museum for $25.00 a year for an individual. The purchase of pavers, called our Remembrance Walk, can honor or memorialize a loved one. The cost of a 4"x 8" paver with two lines is $200.00, three lines for $250.00, and 8"x 8" pavers with four lines are $500.00. The Heroes Kiosk holds a 4"x 6" picture of your hero in uniform, if possible. A plaque is placed un they served, branch of service, years in service, and the JWV Post and Department they belonged to, if applicable. Add a photo of your soldier for ten times Chai, Organization to support our museum in this way. HELPING HANDS BRING SMILES ABOUT YOUR PRESIDENT IRIS GOLDWASSER Something New Emergency Kits for ParentsBy Natalie Blank, DP, Child WelfareJWVA has given birth to a new program under the auspices of our Child Welfare chairmanship. We unit (ICU), and PICU represents the pediatric ICU. These kits will contain various basic hygiene sup plies (sample sizes) like shampoo, conditioner, pow der, deodorant, toothbrush and toothpaste, comb and sterile hand soap, also perhaps a magazine for parents and a small toy for a child, etc., to while away the might be a list of local restaurants and hotels. The purpose of these kits is to provide parents who have a child in an ICU ward of a hospital but do not live near the facility and must remain with their child for days or weeks but require the necessities of life. These are emergency situations and we hope to relieve their stress and anxieties while they wait for their children to get medical care. These kits will be held by the hospital social worker for distribution to needy families. A tote bag with the JWVA log, including a com plete kit with sample sized items in a zippered plastic cosmetic type bag cost $10.00, plus shipping. The tote bag alone is $2.50, plus shipping, which your Auxiliary est childrens hospital facility in our convention city. However, your local Auxiliary can participate during the year with your own childrens hospital in a similar manner. Helping Hands Bring Smiles so bring a smile to a devastated and anxious parent. For more in formation/and or ordering totes and kits, contact 202-667-9061. Insurance ReleaseBy Marcia Jacobs, Insurance ChairmanIt has been gratifying to see the interest in JWVA insurance program. I have handed out many applica tions and provided information regarding the insur A few weeks ago I spoke to Lois at J. J. Weisser, and asked if there any new members. Her reply was that there were only one or two new applicants. If anyone has read the pamphlets, they would know what this program covers. The initial policy covers blood replacement, oxygen and ambulance service at a cost of $11.00 a year. There are additional plans for prescription, dental and vision which cost $129.00 for each. Please don't hesitate to contact me if you would like more information. Phone: 732-691-6138 Email: msfrogg99@yahoo.com You can also send mail to me at: Marcia Jacobs 929A Liverpool Circle Our Children Our WinnersBy JoAnne Lifshitz, PNP, Student Awards ChairmanEvery year there are children who amaze and stun our Sisters. Through the generous donations of our membership, we are able to give six of our amazing, hard-working children a student award. This years recipients were: William Achtman has held a 98% average in high school. He was 198 out of 997 students in the graduating class. William is attending Georgias College and State University doing a double Major in Psychology and Pre-Law. His proud grandmother is Shirley Achtman, President of Aux 223 in Florida. Sarah Demsky volunteers at Special Olympic events, teaches piano, and has become very involved in Judaism and the culture. With all this she was the valedictorian for her graduating class. She has carried a 4.0 GPA all through high school. Her mom is Jamie Demsky of Aux. 321 in Florida. She is attending Georgia Institute of Technology. Michelle Levy is committed to whatever she puts her mind to and a personality that makes her a person who will go far in whatever she puts her mind to. She loves her community. She maintains a 2.7 GPA. Johnson and Wales in Providence, RI is where she will be majoring in Baking. Jeanette Levy, her a very proud grandma. Erin Markham -is a talented young lady. She acted, sang and learned the ropes of being backstage for the plays in her school. Erin has worked with children at camps volunteering and showing them how to act and dance and sing. Erin was part of a group call America Music Abroad. They sang in France after touring a Concentration Camp. She realized even more that music coveys a message of respect in any language. Her grades were never below a B. She will be going to Susquehanna University and will be majoring in Arts in Music. Her Grandmother is Gladys Mayer from Aux. 98 in PA. Philip Melnick is an extraordinary young man. Using his life experiences to maintain his interests he A in any course. He is attending Rutgers University where he is majoring in Biomedical Engineering. His Proud Grandmother is Gloria Kaplan from Aux. 41 Nicole Scher spent a large part of her Junior year in the hospital where she was taught. When she returned to main streamed high school, she had to work diligently and extra hard to retain to succeed to keep her marks in accelerated and advanced classes. is attending Long Island University majoring in Art Therapy. With her talent, she wants to help the veterans, seniors and children who need therapy through art. Gail Holtzman, president of Aux.2, from We are all proud of our children. We are very happy that we could help in our own small way. Thank you, Sisters. Remember, there is always next year. Support your museum and honor a loved one by purchasing a space on our Heroes Kiosk. Become a member of the National Museum of American Jewish Military History by contacting Mike Rugel at 202-265-6280 or by email at mrugel@ nmajmh.org. You can also join online, and/or purhahse a paver or spot on the Heroes Kiosk by going to the museum website at nmajmh.org. 20 By Mike Rugel Program and Content CoordinatorOn May 26th, we continued our tradition of hosting the Annual Memorial Day Shabbat Service at Sixth spoke for the museum and Jacob Oberstein represent ed JWV by reading the names of the fallen from the wars in Iraq and Afghanistan. It was another meaning Day to the fore for those who attended. The summer season brought visitors to the muse um. When June comes in our neighborhood, it means its time for the Dupont-Kalorama Walk Weekend. fer free admission and special programs. Our friends from the Jewish Genealogical Society of Greater Washington joined us in the museum to answer ge nealogy questions from our visitors. It was a beautiful day and visitors enjoyed walking our neighborhood. Weve been participating in this event for 20 years and this was our highest attendance yet. We had another large crowd on July 10th when we welcomed radio personality Phil Wood to the museum to discuss Jews and baseball. Wood hosts the pert on the history of baseball. Wood went back to the nineteenth century to discuss Lip Pike, a Jewish play er who was one of the best players of his day. Woods encyclopedic knowledge of the game had him shar ing stories about many players unknown to the casual fan. He also discussed more familiar names like Hank Greenberg, Sandy Koufax, and Ryan Braun. In attendance for Woods talk was documentary The Life and Times of Hank Greenberg, the 1998 greats who enlisted in the Army Air Forces after the attack on Pearl Harbor. Kempners current project is a catcher in the major leagues for 15 seasons. But more importantly, he worked as an OSS spy during World War II working to undermine the German atomic bomb program. Wood described Berg as a mediocre catcher, but a great spy. It should be fascinating to see pleted. Hopefully, well have her back to the museum for a Moe Berg program soon. Its great to see services in our Captain Joshua L. Goldberg Memorial Chapel in the museum. In July, our supporter Dan Levine had friends and family at the museum for a second Bar Mitzvah ceremony on youre interested in using the chapel or other museum facilities. Coming Up Coming Up Coming Up October 25, 2017 November 11, 2017 December 14, 2017Jerry Yellin: The Last Fighter Pilot Veterans Day Shabbat at the Museum Annual Chanukah Party The Shomer Shabbat Contingent Comes to the Museum Shabbat Contingent of the Boy Scouts came to the History. The scouts ranged from Boy Scouts to Eagle Scouts. They were able to tour the entire museum, and they were able to ask the museum staff about any questions that they had. Since the Jamboree participated over Shabbat, the scouts that were Shomer Shabbat could not participat ed. So, the Shomer Shabbat Contingent was started in 1960 when Scout Councils organized Shomer Shabbat years, the Shomer Shabbat Contingent has served over 500 Boy Scouts, from 56 different chapters all over the United States, Canada and Israel. I had the ability to talk to two of the scouts about their trip. They said they were having a great time. I told them about the JWV Scouting Program, which they had not heard of before. They were so excited that they told all their friends at the Jamboree. We had Eagle Scouts that wanted to apply. We told them and their troop leader how to apply and gave them all the forms. If you are interested in bringing your Boy Scout Troop to the museum, please email nmajmh@ nmajmh.org. Boy Scouts exploring the Service Around the World interactive table. Moe Berg was a major league catcher and OSS spy during WWII. Visitor viewing Jews in the American Military exhibit during the DKMC walk weekend. We continue our annual Chanukah tradition with food, music and song as we look at the ways Jews in the American military have continued the tradition of the Maccabees. Well start Veterans Day with a Shabbat service led by museum chaplain Michael Bloom. Afterwards well put together care packages to help hospitalized veterans. Childrens activities in the afternoon. Jerry Yellin will join us to tell the incredible true story of the nal combat mission of World War II. Nine days after Hiroshima, on the morning of August 15th, two Jewish pilots, Yellin and his wingman 1st Lieutenant Phillip Schlamberg took o from Iwo Jima to bomb Tokyo. By the time Yellin returned to Iwo Jima, the war was ocially overbut his young friend Schlamberg would never get to hear the news. 22 22 TAPSDEPARTMENT AT LARGE Goldstein, Louis Post 100 DEPARTMENT OF CALIFORNIA Balzac, Sheldon Post 138 Borsuk, Stuart S. W. Post 512 Falk, Martin Post 603 Goretsky, Maish Post 385 Samson, Maurice Post 603 Sherman, Patricia Post 118 Spivak, Al Post 603 DEPARTMENT OF CONNECTICUT Cohen, Alexander Post 45 Gitlin, Joseph A. Post 45 Luftglas, Roman Post 45 Machenberg, Stanley Post 142 Millstein, Bennett Post 45 Osber, Stuart A. Post 45 Redak, Harvey E. Post 51 DEPARTMENT OF DC Godel, Jacques L. Post 58 Sostrom, John P. Post 58 DEPARTMENT OF FLORIDA Adams, Theodore Post 631 Cohen, Herbert E. Post 440 Hollander, Joel Post 631 Horwitz, Samuel Post 502 Zavodnick, Sam Post 440 DEPARTMENT OF ILLINOIS Kadish, Herbert Post 800 Kish, Frank S. Post 800 Schur, Morton Post 800 Teichman, Melvin A. Post 328 DEPARTMENT OF MIDWEST Kessler, Sheldon Post 644 Sandroff, Charles Post 644 DEPARTMENT OF MARYLAND Greenberg, Martin Post 167 DEPARTMENT OF MASSACHUSETTS Cohen, Edward Post 74 Komessar, Saul Post 211 Kriteman, Morris Post 74 Ravech, Richard R. Post 211 Snyder, Sam Post 220 Yessin, Bernard Post 74 DEPARTMENT OF MICHIGAN Isner, Herbert Post 510 DEPARTMENT OF MINNESOTA Lapinsky, Arnold W. Post 354 DEPARTMENT OF NEW JERSEY Becker, Irving Post 609 Cherkes, A. William Post 126 Cohen, Leonard Post 536 Feld, Harry Post 126 Frankel, Samuel L. Post 126 Gleaner, Harold P. Post 126 Hess, Carl J. Post 741 Mann, Morton L. Post 126 Marder, Abraham A. Post 126 Masters, Solomon W. Post 47 Schwartz, Louis Post 498 Silverman, William Post 39 Singman, Paul Post 498 Spetgang, Irwin Post 126 Stone, Emanuel I. Post 536 Wexler, Herbert Post 76 DEPARTMENT OF NEW YORK Bobroff, Lewis M. Post 425 Cohen, Irving L. Post 652 Davis, Albert H. Post 756 Edwards, David Post 652 Federman, Arthur H. Post 717 Fisher, Herbert B. Post 129 Holland, Herbert Post 105 Israel, Paul Post 41 Kaplan, Howard Post 41 Lehrer, Meyer J. Post 41 Lipman, David Post 425 Lippa, Simon Post 652 Mendel, Benjamin Post 105 Miller, Morris Post 129 Morrison, Samuel J. Post 68 Spivak, Bernard H. Post 80 Stern, Walter Post 221 DEPARTMENT OF OHIO Barson, Richard Post 44 Bradley, Philip R. Post 122 Rivelis, David Post 44 DEPARTMENT OF PENNSYLVANIA Haas, Samuel J. Post 499 Harris, Martin Post 499 Lederhandler, Morris Post 575 Lens, Bernard Post 697 Lubell, Joseph Post 239 Morris, Edwin J. Post 575 Moskowitz, Albert Post 305 Piatetsky, Albert Post 98 Rudoy, Ruth P. Post 499 Simon, Marvin Post 215 Stein, Maurice Post 697 Taub, Burton Post 305 DEPARTMENT OF SOUTHWEST Molay, Arthur F. Post 194 Sheinberg, Haskell Post 203 DEPARTMENT OF TALO Miller, James S. Post 753 Jewish War Veterans of the U.S.A.31st Annual Mission to Israel April 30-May 9, 2018 Join us on JWV's 31st Mission to beautiful and historic Israel! Witness the wonderful achievements of this small Jewish country, celebrating its 70th Independence year. We visit places other groups do not visit. Get updated be Jewish or a veteran to travel with us, so bring your family and friends! Its more than a tour, its a meaningful experience! Package includes: Round trip coach class tickets from JFK (New York) with EL AL Israel Airlines. Call aviatours for other cities. the group). Superior First Class hotel accommodations (similiar to Sherton or Crowne Plaza in the US). Full Israeli buffet breakfast and dinner daily. Daily sightseeing tours in an air-conditioned deluxe bus with the services of a licensed English speaking guide (the wonderful Ronit! ).You are hereCost is $3870.00Based on double occupancy. All entrance fees to sites as per program. All taxes and service fees as imposed by hotels. Earphones so you can easily hear the guide. Tips per day, per person, for guide, driver, hostess, and hotel restaurant staff. For more information about this trip, please visit the JWV website or contact Christy Turner at JWV Headquarters: 202-265-6280 x417 or email at: cturner@jwv.org. Name Address Amount of payment: Check Visa MC Amex Card # Exp: 1st line 2nd line (no more than 30 characters per line) Only $30.00 per 1 line, or $50.00 for 2 lines, you can purchase a one year subscription which includes greetings for 4 issues! the form and send it along with your payment to : Jewish War Veterans 1811 R Street, NW Washington, DC-20009Send a greeting or message to family and friends in the next issue of The Jewish Veteran! Allan & Sheila Abramson Good Health & Happiness to All PNC Lou & Gloria Abramson Good Health & Happiness to All Any Jewish WWII person captured and sent to Aushcwitz, etc., and survived PDC Ed & PDP Louise Baraw Eugene Baraw Post 336 Howard M. Barmad Post 76 NJ Chag Sameach In Memory of Bert Stolier Allan & Nikki Berger Howard A. & Dorothy G. Berger Naples/Denver USFA/USASETAF PNC Jerry & PNP Joanne Blum Good Health & Happiness to All In Memory of All who gave their lives Post 652-Merrick, NY In Memory of Harold Cohen Post 212 PDC Jack & Ruja Cohen Post 749 PDC Elliott Donn & PAP Elissa Donn CT Best Wishes & Good Health to All Marshall & Diane Duberstein Gerald H. Elkan North Carolina Harold Engleman, K.C.C. / NEC Nat'l Chaplain Jerry Farris Post 239 Arthur Fleischman PPC 717 & 258 David Goldberg, K.C.C. In memory of Sam Goldberg In Memory of Norman Goldberg, PPC #98 PNC Nate & Selma Goldberg Albany 105 PDC Sidney B. Goldberg Abe Cohen Leaman Post 50 Alan J. Gould Post 105 In Memory of Sam Gould, Post Cmdr. Happy Holidays Post 169 PNC Sam & PNP Barbara Greenberg Happy Holidays to All Arthur H. Greenwald Post 321/69 National Adjutant 2016-2017 PNP Petra C. & Jason A. Kaatz Beth Kane Wishes You Good Health Happy Holiday! CMDR Laurence & Marilyn Kaufman Saluting the Men & Women of Post 46 Jack Kent (Kantrovitz) Post 62 OH In appreciation of Rabbi&Myra Feinberg In Memory of PCC Harry Kreiger, DEC Gieir-Levitt Post 655 Dr. Arlene Mars Kushner In Memory of Herb O. Zemble Post 176 Lchaim To Life In Honor of Dr. George Mangeim WWI PNC Ira & Shelley Novoselsky Happy Holidays Dr. Jack N. Porter Post 211-MI In memory of my dad, Irving Porter Bernie Rader Post's 20 and 642 In loving memory of those who served In Memory of PNC Ed & Helene Robins Jerry & Lea Rosenberg Post 740 NJ Good Health & Happiness to All Herb & Francie Rosenbleeth Happy Holiday to You and Yours! To All Our Troops Be Safe, Be Well! PNP Freda & PNC Norman Rosenshein Good Health & Happy Holidays IMO Post 42's Four Legs of the Table Marty, Morris, Murray & Warren Stephen & Helen Sax To the 2% Irv Schildkraut PPC Post 440 USMC-USNR-USA Harriet & Norman Schnitzer PDC PNC Lawrence & Judith Schulman Our Very Best Wishes to All PDP Linda & Stuart Singer In memory of PDC Bill Singer PPC Norman & Toby Smith Post 129 NY Toda Shalom & Good Health to all JWV CH Murray Stadtmauer Post 648 In loving memory of Clare Stadtmauer Shalom & Mazel Tov to all Veterans Greta & Jerry Stoliar Post 346 To All Surviving Jewish WWII prisoners LChaim! NC Paul and Norma Warner NJA Harvey & Linda Weiner Be Well! In Memory of Joan S. Weinstein Major Stuart Adam Wolfer www.msawi.org David S. Zwerin, PDC Post 652 Merrick, NY To All of America's Veterans and Members of the US Armed Forces: Thank You for Your Service!